A quick update on my farming commune for Bolt Action: it goes very well. the painting is done and tonight I hope get through the process of adding flock, static grass and other greenery bits to complete the set. 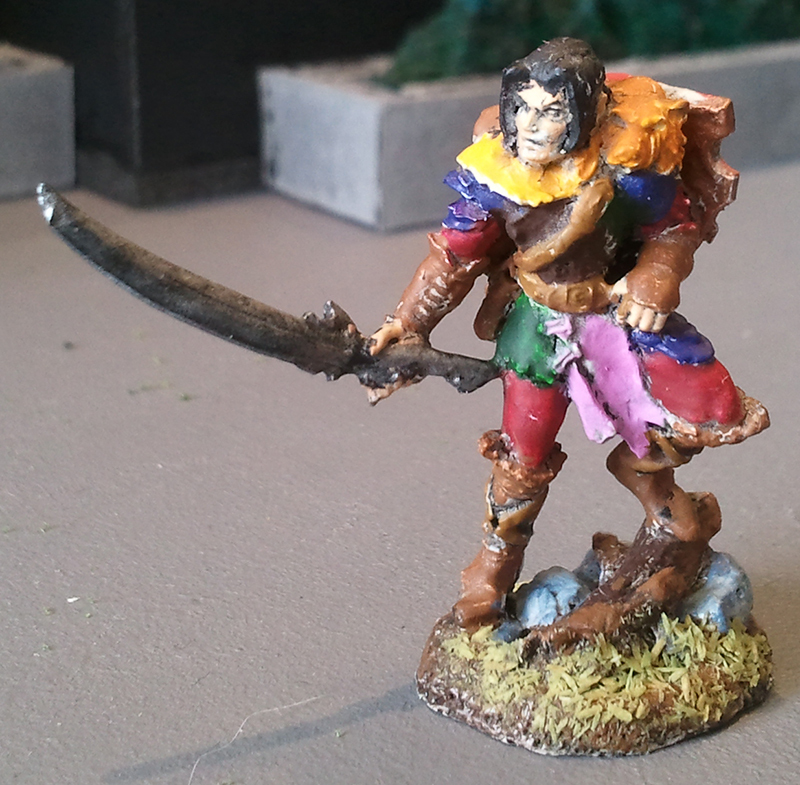 In the meantime, however, I’ve finished off the remaining character for the Pathfinder campaign my mate is currently running. 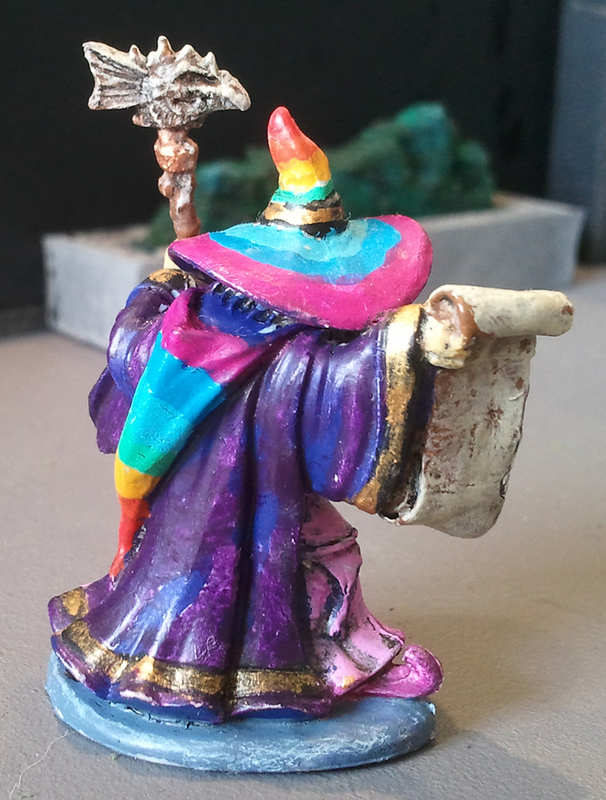 Beginning with our wizard, I decided to incorporate the gay pride rainbow into each character. In addition, purple would be the major over colour and pink the major under colour. 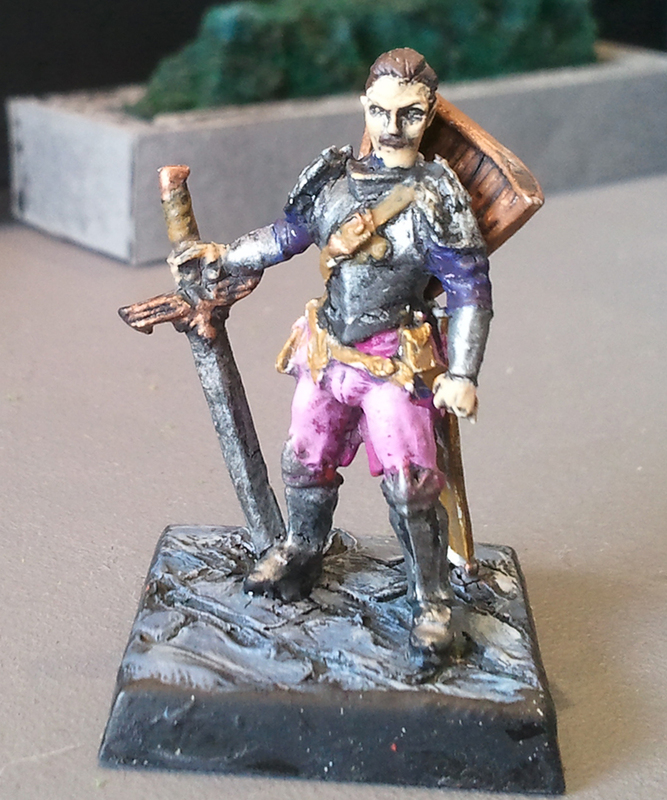 The results are great, especially the wizard, though my cleric turned out a lot better than expected too. 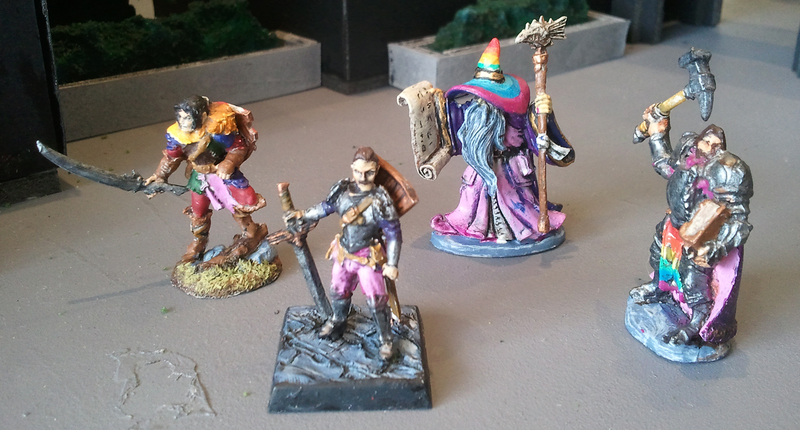 The wizard and cleric are both from Reaper Miniatures “Bones” range while the fighter is from the Pathfinder miniature series and the druid is from Dark Legends (I think). My painting is not the sort that will cause you to reach a state of pleasurable relaxation, but I hope to show that even if you can’t be a painting god, you can still paint good looking miniatures using basic colours and straight forward painting. 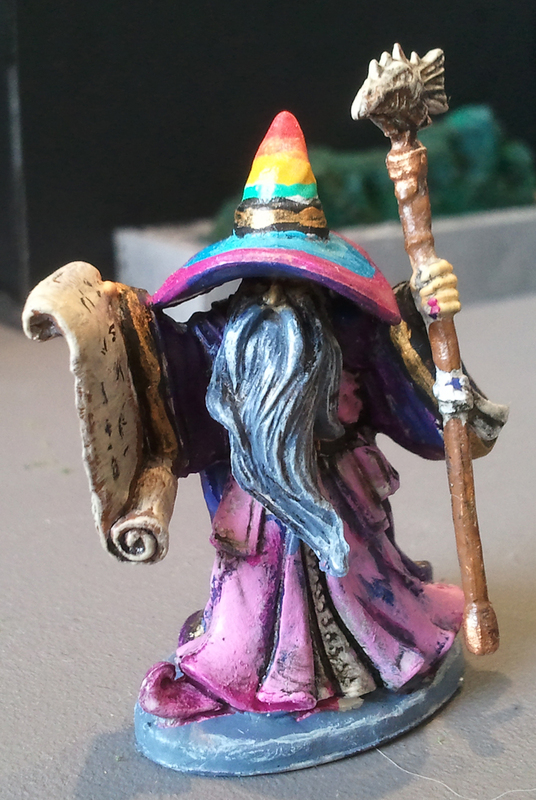 As mentioned, the wizard was done first and his rainbow is a little different becuase of this. The rainbow is present on his hat and hood. The colours (Vallejo Game colour) from top to bottom are: bloody red, hot orange, sunburst yellow, foul green (I think), electric blue (the additional colour, not sure how this ended up in there), magic blue and warlord purple. His robes have Royal purple in the recesses over which I have painted Hexed Lichen. His underrobes are Squid Pink over Warlord Purple. His beard is Wolf Grey (I think, it could also be Ghost Grey or Stonewall Grey, can’t remember, point is; a light grey) over Shaowgrey. I’ve used Glorious Gold for trim. Next was the fighter. 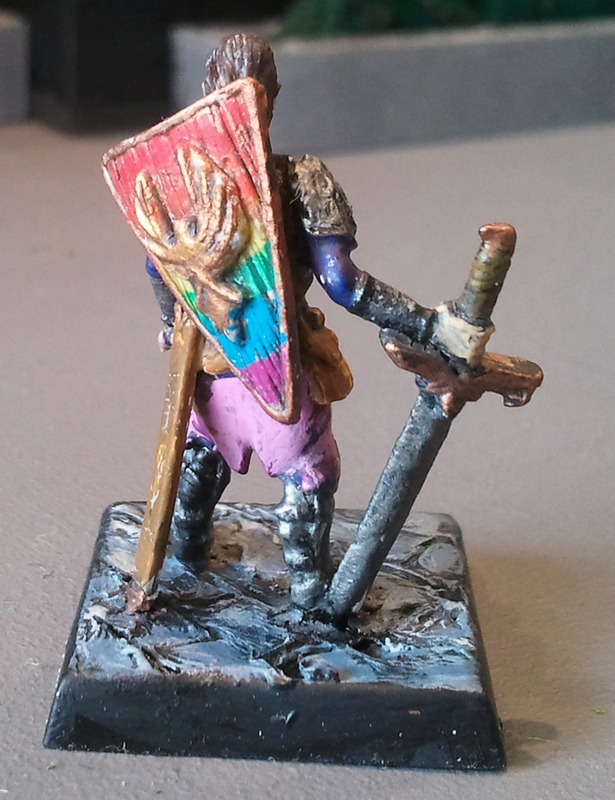 His armour and blade are Gunmetal Grey, pants Squid Pink over Warlord Purple, shirt Hexed Hichen over Royal Purple and his shield carries the rainbow, which is done the same as the wizard except that it does not have Electric Blue in there. His hair was Charred Brown with a Black Wash (Games Workshop, aka G Dubs). The yellow in the rainbow is a little thin, but that’s difficult to fix without repriming the middle section of the shield to redo it. The druid was the most complicated and I am still not sure whether I like the outcome. 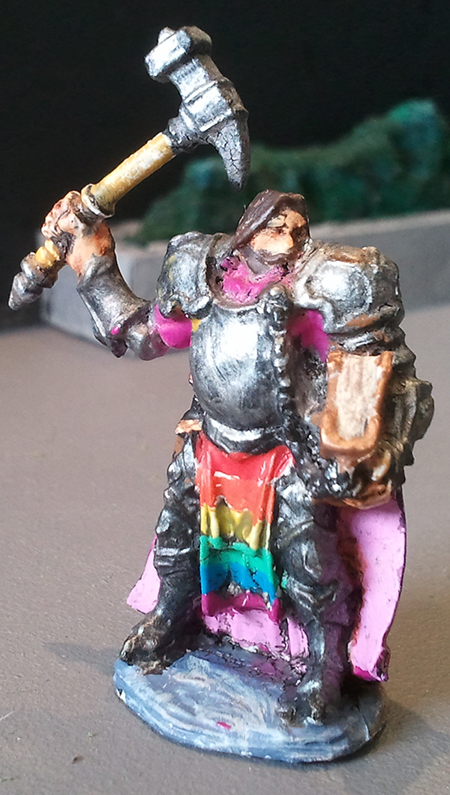 Again the rainbow is preset on his shield, which is slung on his back. His sword is Gunmental Grey, his armour contains Dark Green and Charred Brown, the cloth dangling around his waste is Squid Pink, his sleeves are Hexed Lichen and his pants Scarlet Red. His boots and gloves are Beasty Brown with straps of Leather Brown. The animal pelt over his shoulder is Souflulous Brown (I think). Finally his water canteen (on his back) is German Camo Beige (Vallejo Model Colour). Finally my cleric. 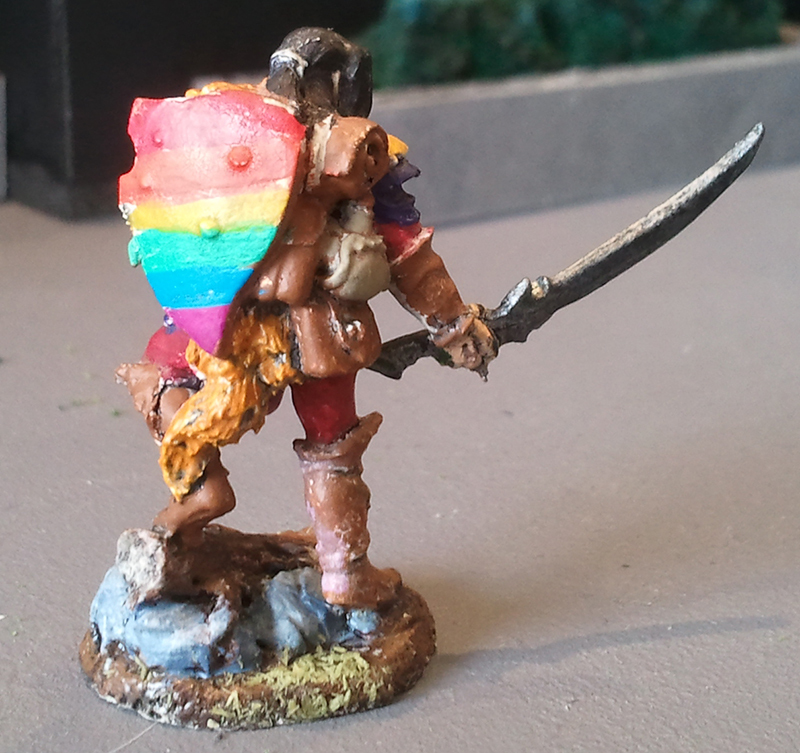 The rainbow is present on the front again, which I much prefer than being hidden on the back. 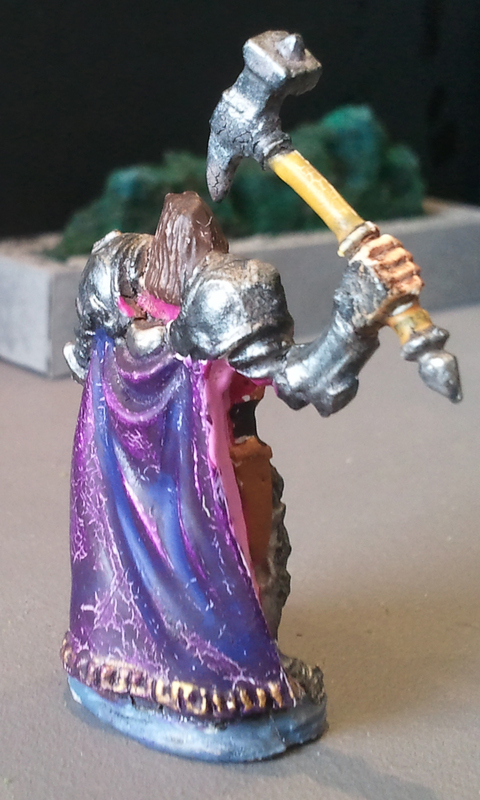 His armour and warhammer are Gunmetal Grey highlighted with Silver, the haft of the warhammer is Foul Brown (I think?). His cloak is Royal Purple in the recesses and Hexed Lichen as the main. His hair and beard are just straight charred brown. All in all, pretty pleased with the outcomes and for the first time in a long time every character in one of our campaigns will have their own model!